There’s hypocrisy and then there’s the brand of hypocrisy that is part of the Cornwall Ontario Bully Culture. When asked about an incident of alleged bullying, with a racial slant, that occured in his pre police days, this is what Chief Aikman sent to this newspaper. Mr. Gilcig, I received your email of November 22, 2018. One might suggest that Chief Aikman was in fact being a bully by sending such an email. He certainly wouldn’t be the first official to be asked a question about their behavior by a journalist. He and CAO Maureen Adams refused to state how much that response cost the city as it clearly seems written by a legal professional. Bullies are not very brave. They depend on enablers and cowards to perpetuate their actions. (or high priced city paid lawyers) Several years ago I covered a sit in at MP Guy Lauzon’s office. After leaving I was phoned after by some of the activists complaining about having the event broken up by police. When I phoned to confirm Mr. Aikman had a laugh when I stated that I hadn’t seen any police presence while there or while leaving. Likewise, when Tracy Champagne was served legal papers by us for publishing that we write fake news I had a knock on my door by two CCPS officers in full CERT gear with sunglasses, combat gloves, and guns on their chests instead of their sides. A reasonable person would most likely consider this bullying as well. Especially as the police were saying that even though I wasn’t seen serving Ms Champagne, which wouldn’t be against the law, that she didn’t want me on her property. Oddly enough I’ve never been on her property. Essentially the police decided to “Bully” me on the public dime, perhaps because of Ms Champagne’s connection to Mayor Bernadette Clement? But this is the tip of the iceberg. How many cases has the CCPS covered up or not disclosed? How many people asking for help for bullying have not been supported by the CCPS? We’re working on a story about bullying in schools. Where have the CCPS been when it comes to these school age bullies who only rarely are ever seen on the pages of the police blotter? Where were the CCPS when CCVS had swastikas carved in its walls in a boys washroom? 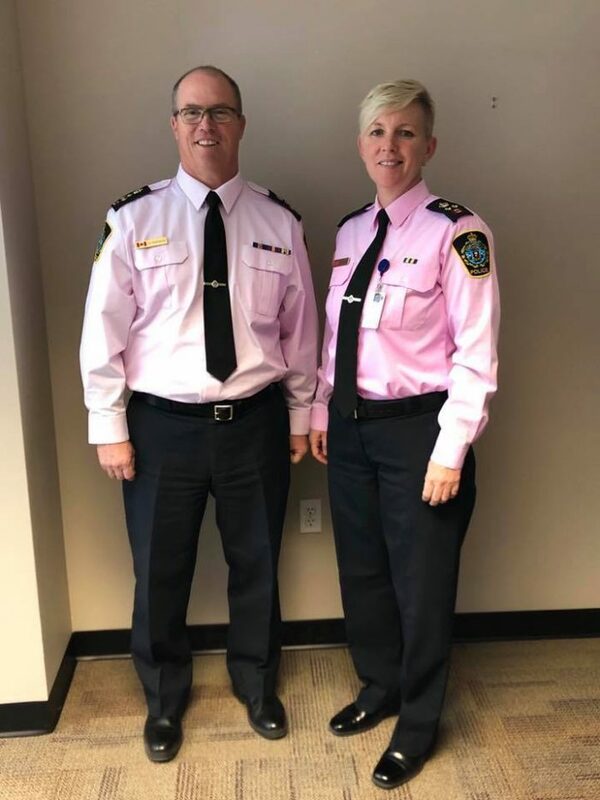 To see Ms Spowart and Mr. Aikman in Pink shirts is a total affront to the true victims of bullying, some at their own hands. Cornwall sadly has a problem with its bully culture stemming from its political system where bullies like Ed Lumley, Guy Lauzon, Tammy Hart, Elaine MacDonald, and right down to current Mayor Bernadette Clement have ruled the roost for far too long. And the enablers frankly are a bigger problem than a Barney Fife wannabee and his band of thugs. That system needs to be stood up to. Until the enablers of it stand on their own feet we will continue to see systemic bullying in the Cornwall Ontario area.